A set of Maxell 3 inch floppy disks, model CF2-D. The customer from France, had text data stored on the double-sided diskettes. While he was not certain which word processing package was used to compose the text on these diskettes - perhaps LOTUS 1-2-3, perhaps WORKS, we ascertained it was Locoscript. The disks were sent for us to convert this text data to a current format eg. open in Microsoft Word. The disks were double sided 720kb probably from PCW 8512 or PCW 8256. If you need a Maxell CF2-d disk conversion service, then contact our friendly company. 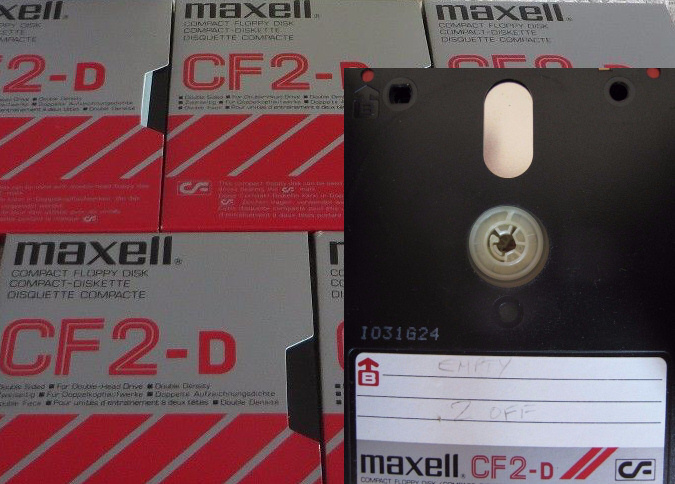 A set of Maxell 3 inch floppy disks, model CF2-D. The customer from France, had text data stored on the double-sided diskettes. While he was not certain which word processing package was used to compose the text on these diskettes - perhaps LOTUS 1-2-3, perhaps WORKS, we ascertained it was Locoscript. The disks were sent for us to convert this text data to a current format eg. open in Microsoft Word. The disks were double sided 720kb probably from PCW 8512 or PCW 8256..